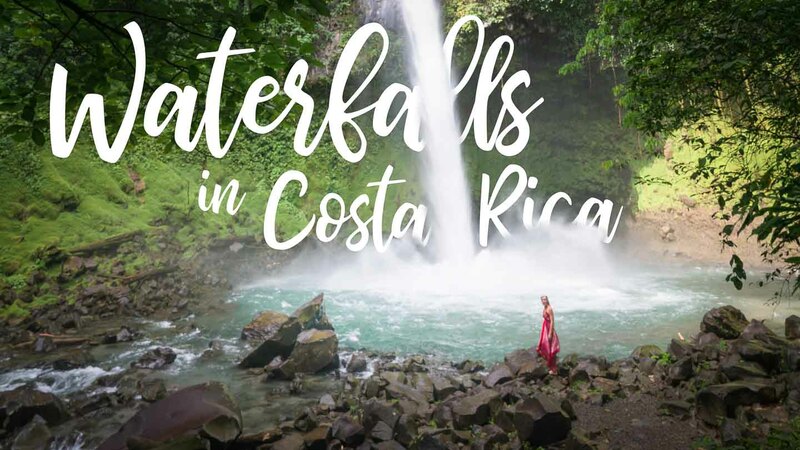 Costa Rica is packed full of amazing adventures and wonderful sites, with thousands of acres of rainforests to trek in, glistening rivers, impressive volcanoes and of course with all of this lush land comes some pretty incredible waterfalls. From huge gushing roaring waterfalls that power their way over the top of huge cliffs, to more gentle and serene picturesque falls that have become popular beauty spots for locals to enjoy, there is no denying the beauty of Costa Rican waterfalls. So, whether you are into some serious jungle trekking with a beautiful waterfall to cool off in at the end or simply looking for a nice stroll alongside some picturesque falls then look no further: we have rounded up the most epic waterfalls in Costa Rica for you to chase. We had the waterfall to ourselves! Nestled in the depths of central Costa Rica in the Alajuela Province at the base of the dormant conical 1,633 meter Arenal Volcano is the stunning La Fortuna Waterfall. After meandering its way through the depths of the rainforest, through valleys in between mountains the Arenal River explodes out over the rocks creating the spectacular picture-perfect 75-meter high waterfall. The area surrounding the volcano was made up of sleepy farming communities until 1968 when the volcano erupted after almost 400 years of laying dormant and started attracting tourists to take in the site. Since then, the area has been one of the top destinations for visitors to Costa Rica due to the huge range of outdoor activities that people can take part in around the area, but despite the tourists, the La Fortuna falls are as beautiful as ever and well worth your time. Just make sure to arrive early if you want to beat the crowds. If you’re spending one week in Costa Rica reserve 2 nights for Arenal. The falls are just a short walk from the town; along with the falls, there are also relaxing hot springs to discover as well as a whole host of restaurants and hotels to help make your visit easier. La Paz means ‘the peace’ in Spanish and La Paz waterfall really does live up to its name. The area surrounding it is rich in nature and wildlife due to the altitude of between 4,000 and 5,000 feet meaning a bio-diverse environment that supports both a spectacular cloud forest and a lush rainforest. Located just an hour from San Jose on the rich hills of the Poás Volcano, the waterfall can be accessed by hiking on paved trails through the rainforest inside the La Paz Waterfall Gardens Park. If you want to catch a glimpse of these powerful waterfalls for free there are trails that connect to the falls from the main road that do not lead to the grounds of the park, however the La Paz Waterfall Gardens offer in-depth guided tours and a chance to learn about the surrounding natural environment and the animals under their care. Unfortunately, you cannot swim in the pools as it is too dangerous, but La Paz waterfall is still well worth your time. We highly suggest staying at the Peace Lodge which is on the grounds of the La Paz Waterfall Gardens and your stay includes entrance to the gardens. The hotel is gorgeous and the rooms are out of this world with fireplaces, waterfalls, and much more. It’s the perfect place to start or end a honeymoon in Costa Rica. Entrance: Adults: $44, Children (3-12): $28, for an additional fee add-on experiences, are available including a guided animal encounter and a waterfall gardens tour. Up high in the rural northwestern mountains of Costa Rica, nestled inside the boundaries of the Tenorio Volcano National Park are the Rio Celeste Falls. An astonishing natural wonder these falls are unusual in their striking blue color. The legend surrounding it says that when the Gods had finished painting the sky blue they washed their brushes in the water, giving it it’s faded blue coloring. However, researchers have concluded that the blue comes from the convergence of two clear water rivers at the el Teñidero, but the story is nice anyway. The waterfall can be accessed by hiking the main trail along the Rio Celeste river through the surrounding rainforest which takes around 3 hours, guides can be arranged but are not always necessary. The blue of the water is most prominent during the dry season from December to April but can still be seen all year round. Arguably the most picturesque of waterfalls in Costa Rica, the Llanos de Cortez waterfall can be found 5km north of Bagaces. You can swim in the crystal clear cool waters of the pool at the bottom of the waterfall, sunbathe on the tranquil sandy banks and recline on the chilled moss-covered rocks behind the falls. To get to the park you can drive from the nearest town or take a bus and walk the 1.5 kilometers from the bus stop. The entrance fee is optional and even includes access to a washroom and a lifeguard. The falls can be found just a short 10-minute walk from the car park and can be enjoyed all year round. The area surrounding the pools are rich with wildlife and a little exploring could be paid off with glimpses of intriguing fish and reptiles. If only this place was on our doorstep, we would be hanging out there every day! A hidden gem of a place, Bajos del Toro Waterfall hasn’t yet made it onto the pages of the big guidebooks, meaning it has less of the tourists but all of the beauty of other waterfalls in Costa Rica. One of the biggest in Costa Rica with a 295-foot drop, Bajos del Toro Waterfall is extra stunning as water flows over the colorfully streaked rocks and pours into the crater of an extinct volcano. The waterfall is part of a huge private 250-acre rainforest reserve, a well-maintained trail leads from the carpark to the falls and along the way viewpoints offer the chance to catch a glimpse of some of the local wildlife. There is no swimming allowed in the pool of the waterfall, but the lush green jungle surrounding it is perfect for those who like a strenuous hike – your efforts might just be paid off with a puma sighting! The area sees very few people visiting, so even if you don’t see an illustrious puma the chances are you will get to see some amazing wildlife during your visit to the falls. Along a 4km track winding its way into the depths of the rainforest are the tranquil waters of the Nauyaca Waterfalls. Consisting of two glistening tiers the falls are located in a 262-foot wide canyon that, at their tallest spill over from 147 feet high. The cascades of water pour over from above, falling into the lower falls where visitors bask in the sparkling waters of natural pools and lounge on rocks surrounded by the green depths of the jungle. Bring your snorkel along and spot the fish swimming in the waters, too. From the upper falls the views can be spectacular: make sure you keep a careful eye out from up here, as all sorts of interesting creatures can be spotted enjoying the waters! You can reach the falls on foot along a well-signed path through the jungle, which takes about an hour, but after a sweaty hike through the jungle, a swim in the cooling waters of Nauyaca will feel even more refreshing. Horseback rides and jeep rides are also available for a price if you don’t feel up to the hike. One for the more adventurous out there, the Diamante Waterfall is a set of two gushing 600-feet tall waterfalls that pour over the mouth of a huge cave. Sounds exciting, right? If you dare, you can be even more adventurous and arrange to stay in the cave overnight; beds and facilities such as a kitchen for visitors to use have been set up by tour companies in the local area. Pacific Provider is a popular company, read TripAdvisor reviews here. To get to the waterfalls you have to use a local guide who will help you navigate the strenuous 3-hour hike along a trail which meanders its way up steep steps and through the jungle to the waterfalls and cave. Swimming in the natural pools at the bottom of the pool is allowed, and guides from the local tour companies are informative about the surrounding nature and wildlife. Los Chorros, meaning ‘the jets’ are two twin waterfalls, the Catarata Zamora and Catarata Prendas that are set in the grounds of the lush Los Chorros Municipal Recreation Park just outside San Jose. The pair of stunning waterfalls pour from the rocks in the hillside and shoot cool water from 131 feet above and spray a refreshing mist on to visitors standing below. Set not too far from the roadside, these falls are much easier to access than others. Just a quick 15-minute walk from the parking lot and the first of the gushing waterfalls appears – another 10 minutes down a steeper slope the second comes into view. Take along some food and drink and enjoy a picnic in the designated picnic area; locals from the area usually gather here at the weekend with friends and families to enjoy the surrounding nature and spend time together. There are even facilities for visitors to use so taking a dip in the refreshing waters should not be a problem. Why not spend the day here, relaxing and enjoying the atmosphere of weekend life in Costa Rica? Not one but three separate falls make up what are arguably the most famous waterfalls in Costa Rica, the Montezuma Waterfalls. The three cascades that pour in the Montezuma River, close to picturesque beach village of Montezuma, are popular with tourists, but don’t let that put you off: it’s still an adventure to get to them. To get there visitors have to walk up the river for around 20 minutes until reaching a huge swimming pool with water cascading into it from the tallest of the three waterfalls, which is around 82 feet. From here, a scramble past the pool, over some rocks and tree roots and down a rope, and the second of the three falls appear. Some people jump the 39 feet from the second waterfall into the pool below, but we wouldn’t recommend trying it out. For a less hair-raising experience, the 5-meter jump from the third waterfall is safer, and there’s also has a fun rope swing to play on! A breathtaking spectacle of nature, the Bijagual Waterfalls are purportedly the tallest of waterfalls in Costa Rica at a staggering 600 feet high. Surrounded by the rainforest next to Carara National Park Jungles and hidden behind a canyon, the falls are located among a 300 acres farm owned by a Costa Rican family. Look for a sign that says Catarata and waterfalls and nearby you will find a friendly local man that will help you with parking and will answer any questions you might have, he keeps the only trail well maintained and will ask for a fee before you walk the trail to the waterfall. After the hour-long hike through the jungle past nature, beautiful views and with glimpses of wildlife such as toucans, scarlet macaws, and green poison dart frogs, the Bijagual Waterfalls are an amazing site to see. Cool off in the pools at the bottom of the waterfall and relax among the peaceful sounds of nature: these less known waterfalls should be on your Costa Rican itinerary. Address: Jaco, Garabito Municipality, Costa Rica. Have you been to Costa Rica? What was your favorite waterfall? We are always looking for more waterfalls to chase! Have you even been stamped at Africa? There are some magical beautiful waterfalls here too! Hope you love Costa Rica! Yes we have been to Africa, we have gone on 2 African safaris spending a total of 110 nights camping in Africa. It was EPIC. What is your favorite waterfall in Africa? So stunning! I haven’t been to Costa Rica but from your photographs, I think my favourite is Rio Celeste for that fading blue tint. There really is nothing like chancing upon a waterfall in the middle of a jungle. I went hiking in Silver Falls State Park, OR last weekend and the waterfalls there are amazing. Is Costa Rica on your bucket list? If not, it should be! The waterfalls are amazing but so are the beaches in Costa Rica. We loved OR but sadly we didn’t have much time for hiking. What’s your favorite hike in Oregon? Wow, Llanos de Cortez looks incredible (well, really they all do!). I’ve never even heard of most of these. 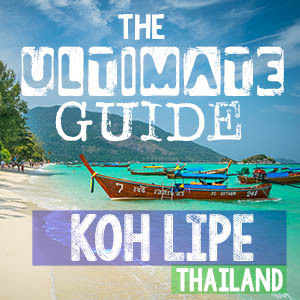 Awesome list, will definitely be referencing for my trip to Costa Rica next winter! Glad we could help put together your upcoming Costa Rica trip. Hope you have a fabulous time. Safe travels.